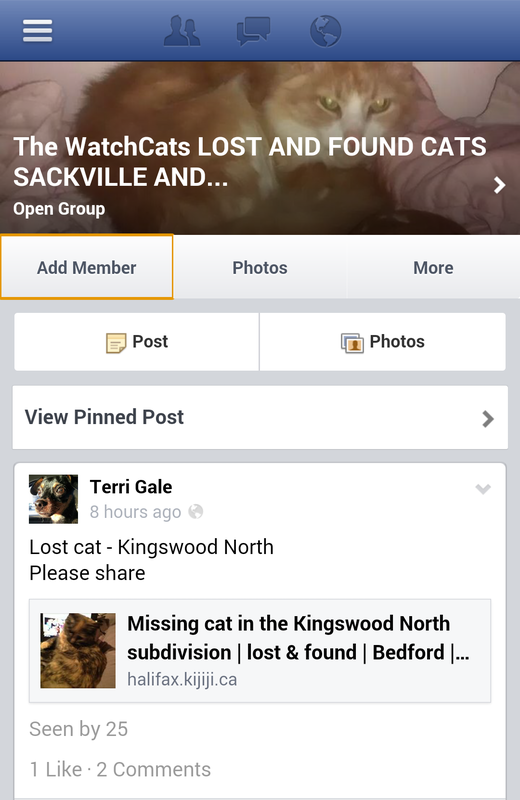 WatchCats Is *The* Page For #Sackville / #Bedford & Area Lost And Found Cats. | Sack-Vegas!!!! WatchCats Is *The* Page For #Sackville / #Bedford & Area Lost And Found Cats. If you have lost a cat, found a cat or want to adopt a cat this is the group for you. This is a very busy and well run Facebook group that covers all things CAT in Bedford, Sackville and surrounding areas. Be sure to check the link below and have a look. Big thumbs up to the WatchCats! Posted by Sacky on May 12, 2014 in Uncategorized. Lost orange female tabby wearing black collar, approx 9 yrs old. Lost in Twin Brooks area. Please call 483-3650 or email. Thanks.